When building a new house or retrofitting an existing one, choosing the right type of roof can be more difficult than most people realize. Roofs do a lot more than just serving the most basic practical purpose of protecting a house and its occupants from the outside elements. For instance, a roof’s shape plays a major role in defining the overall look and style of a house. Roofs can also provide additional living space, as well as make your home more resilient, energy efficient, and weather-proof. This definitive guide to roof architecture and styles will help you understand and identify the best roof shape for your home, shed, garage, or a place of business. We will also explore recommended roofing materials for the common roof types. Also known as pitched or peaked roof, gable roofs are some of the most popular roofs in the US. They are easily recognized by their triangular shape. Pros: Gable roofs will easily shed water and snow, provide more space for the attic or vaulted ceilings and allow more ventilation. Their inherently simple design makes it easy to build them and cheaper than more complex designs. Cons: Gable roofs can be problematic in high wind and hurricane areas. If the frames are not properly constructed with adequate supports, the roof can collapse. High winds can also cause materials to peel away from gable roofs. If there is too much of an overhang, winds can create an uplift underneath and cause the roof to detach from the walls. If a gable roof is used in high wind areas, be sure proper braces are used and have the roof inspected after a large storm to ensure no damage has occurred. Suggested materials: Gabled roofs can be covered with almost any type of material including asphalt shingles, cedar shakes, metal, and clay or concrete tiles. However, if the roof also contains hips and valleys, it should either be shingled or roofed with metal shingles or standing seam to help prevent roof leaks. Note: It is recommended to use at least a 10/12 pitch or 40° angle, for snowy regions. Side Gable: A side gable is a basic pitched roof. It has two equal panels pitched at an angle, meet at a ridge in the middle of a building. The triangle section can be left open for an open gable roof, or it can be enclosed for a boxed gable roof. Crossed Gable: A crossed gable roof is two gable roof sections put together at a right angle. The two ridges are perpendicular to each other. Lengths, pitches or heights may or may not differ from each other. It’s an excellent roof design for homes with separate wings. Use a cross gable to accent different areas of the home, such as the garage, porch or dormers. It’s often seen in Cape Cod and Tudor styles houses. Front Gable: A front gable roof is placed at the entrance of the house. This design is often seen in Colonial style houses. Dutch Gable Roof: A Dutch gable is a hybrid of a gable and hip roof. A gable roof is placed at the top of a hip roof for more space and enhanced aesthetic appeal. A hip roof has slopes on all four sides. The sides are all equal length and come together at the top to form a ridge. Pros: Hip roofs are more stable than gable roofs. The inward slope of all four sides is what makes it more sturdy and durable. They are excellent for both high wind and snowy areas. The slant of the roof allows snow to easily slide off with no standing water. Hip roofs can offer extra living space with an addition of a dormer or a crow’s nest. Note: For high wind areas, or strong storms, a pitch of 4/12-6/12 (18.5°-26.5° angle) is recommended. Cons: Hip roofs are more expensive to build than a gable roof. It’s a more complex design that requires more building materials. Also, with the addition of a dormer, additional seams can make it easier for the water leaks to form in the valleys, if a roofing system is not properly installed. Note: Proper construction and maintenance is a must to prevent minor issues from turning into major problems. Suggested materials: Hip roofs, like gable roofs, can be with almost any type of roofing material, such as shingles, metal, or tiles. Simple Hip: The most common type of a hip roof. It has a polygon on two sides and a triangle on two sides. The sides come together at the top to form a simple ridge. Cross Hipped: Similar to a cross gable roof. Use separate hip roofs on homes with different wings. The line where the two roofs meet is called a valley. Note: Valleys can allow water to pool. Proper waterproofing is a must. Half Hipped: A standard hip roof that has two sides shortened to create eaves. A mansard roof, also known as a French roof, is a four-sided roof with a double slope on each side that meet forming a low-pitched roof. The lower slope is much steeper than the upper. The sides can either be flat or curved, depending on the style. Pros: Mansard roofs can help create a great deal of extra living space. Using the space as a full attic or living quarters, called a garret, is very popular. The style lends itself to either open or closed dormers for more aesthetic appeal. Mansard roofs are great for people wanting flexibility to make future home additions. When first designing and building a home, you can actually save money by having a simple mansard design to start off. – You can then add on a garret or dormers at a later date. This will not only add value to the house, but it also allows homeowners to easily make additions as their needs change. Cons: A low pitched portion of a mansard roof isn’t ideal for areas receiving heavy snowfall. Mansard roofs cost more than typical roofs because of the embellishments and details that go into them. But, the added space and character can more than make up for the extra cost of initial construction. Suggested materials: Since a mansard roof has such a unique design, choosing a unique material could make the roof that much more special. Using metal, such as copper or zinc for the steep portion of the roof, can be more expensive up front, but will require much less maintenance down the road, making it a good long-term choice. Using wood or slate shingles in a diamond pattern is a way to make a mansard roof stand out. However, overlapping composition shingles should not be used. Asphalt shingles can still be used on a steeper portion of the roof in a regular pattern. Most materials can be used for a mansard roof, but be aware of the low slope part of the roof. Ensure it is properly flashed and waterproofed to protect the roof’s integrity. Mansard roofs can take various silhouettes, including straight-angle, convex or concave. Windows are very important to provide light for the extra living space provided. Grand houses may also display wood quoins, trim or decorative cut stone. A Gambrel or a barn roof, is much like mansard in a sense that it has two different slopes. The difference between the two is that the Gambrel only has two sides, while the mansard has four. Similar to mansard, the lower side of the Gambrel roof has an almost vertical, steep slope, while the upper slope is much lower. Gambrels are not only seen on top of barns, farm houses and log cabins. They are also seen on Dutch Colonial and Georgian style homes, as well. Pros: Much like the mansard, the Gambrel provides extra living space for a garret, attic or loft. Plus it’s simple to frame out. The Gambrel only uses two roof beams, along with gusset joints. Since the construction is quite simple with fewer materials needed, this helps to keep the cost of a roof down. Gambrel roofs are also a great idea for outdoor sheds and storage buildings. Their shape can provide more storage without taking up more space. Cons: The Gambrel roof is not recommended for heavy wind areas or regions that receive significant snowfall. The open design can cause the roof to collapse under extreme pressure. Gambrel roofs also need to be constructed well, waterproofed at the ridges and maintained on a regular basis. It’s a good idea to have a Gambrel roof inspected each year to check for damage from storms, heavy rainfall or snow. Windows are recommended to add light to the extra space. This is both a pro and a con. While all details will add to the overall beauty of a home, they increase chances for water leaks to occur. Suggested Materials: The material used for a Gambrel roof will depend on the style of the house. Wooden, asphalt or slate shingles are widely used. However, using metal will greatly cut down on the amount of maintenance required. Note: If a Gambrel roof is used in extreme weather areas, insist on reinforced trusses, especially on the upper pitch. As the name suggests, flat roofs appear to be completely flat with no pitch. However, they do have a slight pitch to allow for water run-off and drainage. These roofs are generally used on industrial or commercial buildings. However, they can also be installed on residential houses in both high and low rainfall areas. Pros: Extra living space on the roof for a patio, garden or partially enclose for a penthouse room. Heating and cooling units can also be placed on flat roofs, keeping them out of sight. – This is especially common practice in commercial roof designs. The design is also conducive for installing PV solar panels for a more energy efficient and energy independent home. Flat roofs are easier to construct than pitched roofs and require fewer building materials, keeping costs down. Cons: The low pitch makes flat roofs more susceptible to water leakage. They are not advised for high rainfall or high snowfall areas. Although the upfront cost of building a flat roof is less expensive than a pitched roof, they can be more expensive in the long run due to maintenance and ongoing roof repair and replacement costs. Suggested Materials: Ensuring a flat roof is waterproof is imperative. Using material that is continuous with no seams is the best. The most common materials used are tar and gravel, roll roofing, metal sheets, PVC, TPO, and rubber membrane. Note: Green roofs are also on the rise in popularity. They are aesthetically pleasing, energy efficient, thanks to all the vegetation acting as an additional layer of insulation, with cooling properties, and help combat the urban heat island effect. Layers are created using beneficial plant life, soil, drainage, and waterproofing membrane. Skillion is also referred to as a shed roof or lean-to. It is a single, sloping roof, usually attached to a taller wall. – It can be thought of as half of a pitched roof, or as a more angled flat roof. Skillion roofs are mostly used for home additions, sheds and porches. However, they are also now being used on the entire structure of more modern style homes. Pros: Skillions are easy to assemble and use much fewer building materials than other roof types. Their steep pitch allow snow and water to easily run off, which makes them excellent for high rain and snow regions. They can also be used purely for design purposes to add architectural interest and aesthetic appeal. Cons: If a roof pitch is too high it can result in ceilings being too low. Also, homes using only a skillion roof can have problems in high wind areas. Suggested Materials: Because of the steep incline, rubber skins and roofing membranes can be eliminated. To give a more streamlined look, you can use standing seam rather than tiles or shingles. For a more Eco-friendly and energy independent home, large PV solar panels can also be installed. A Jerkinhead roof uses elements of both gable and hip roofs. It can either be thought of as a gable roof with hipped ends (cut short with the points turning downward). Or, it can be described as a hip roof with two short sides. – They may also be referred to as clipped gable or English hip roofs. Pros: Jerkinhead roofs are more stable than a regular gable roof. By clipping, or turning the point down, the roof becomes more resistant to wind damage. They also provide more space than a traditional hip roof. The higher pitch offers more living space, while providing better reinforcement. Jerkinhead roofs give architectural interest to any home. Cons: The more complex design will make building costs higher. Suggested Materials: The Jerkinhead roof can be constructed of most any roofing material. A butterfly is a V-shaped roof constructed of two tandem pieces which are angled up on the outside. The midsection is angled downward where the two pieces meet into a valley. The overall effect is of a butterfly’s wings in flight. The butterfly roof is popular for modern, Eco-friendly and tropical home designs. Pros: The upper angle of the outer edges allows larger windows to be used. This gives the home more natural light, lower heating bills in the winter and brings an open feel to the design. The valley in the midsection of the butterfly roof allows rainwater to be collected, making it beneficial for high drought areas. A downspout attached to a rain barrel or other type of water reservoir is usually installed for this purpose. The butterfly roof lends itself to an environmentally friendly home design, as PV solar panels, water collection systems and natural light can all be easily incorporated. Cons: The complexity of the design makes the butterfly roof more expensive. Not only are the upfront costs higher than with conventional roofs, but the maintenance will also be more expensive. Ensuring the butterfly roof is waterproofed is essential. Drainage systems can get clogged, causing water to pool or leak. This will weaken the pillars over time, which can cause the roof to collapse. The open design and tall windows can make it more difficult to regulate the temperature throughout the home. Some areas may be much warmer than others. Suggested Materials: Using a solid, continuous membrane with no seams is the key to keeping a butterfly roof watertight. Other options are to use metal, organic materials or solar panels. Bonnet roofs, also known as kicked-eaves, are double sloped with the lower slope set at less of an angle than the upper slope. It’s like a reverse Mansard. The lower slope hangs over the side of the house. This overhang is an excellent cover for an open porch. Bonnet roofs are not commonly used roofs in modern houses. They were mainly used in French Vernacular and can be seen in regions of Louisiana and Mississippi. Pros: The upper slope provides extra living space for a small attic or vaulted ceilings. It also lends itself to dormers or side windows. The overhanging eaves not only provide protection for porches, but also help to protect walls from water damage. Water easily runs off the slopes of the roof and the modified hip structure make it more durable than a gable roof. Cons: The complex design requires more building materials and it’s more difficult to construct. This makes the bonnet roof more expensive than other, more simple designs. Although water easily runs off the slopes, valleys are formed where the two slopes meet. This can cause snow and water to pool. Extra precaution is needed to waterproof these areas. Suggested Materials: Bonnet roofs can be made from most any type of material, including shingles, metal and natural stone. A salt box roof is asymmetrical in design, with one side being more of slightly sloping flat roof and the other more of a lean to, with gables at each end. Saltbox houses are variations of early Colonial and Cape Cod designs. They arose from the need for more room. Early Americans realized they could add more space with less material by adding a lean to roof to an existing gable roof. Soon homes were built with the lean to roof already added. Pros: The slope makes it easy for water to run off, making the saltbox roof good for areas that receive heavy rain. The asymmetrical design makes it more durable than a simple gable roof. It adds more living space by making a home one and a half to two stories. Cons: The design can be tricky, which makes the building costs higher. Although more living space is provided, it isn’t as much as a regular pitched roof. Also, some of the rooms may have slanted ceilings. Suggested Materials: Saltbox roofs can be made from most building materials. A sawtooth roof is two or more parallel pitched roofs in which the sloped and vertical surfaces alternate. As the name suggests, the roof resembles the side view of a saw blade. Sawtooth roofs were once only used in industrial buildings. However, now they are also used in modern home design. Pros: Windows are placed in the vertical spaces of the roof, allowing more natural light inside the home. The higher peaks provide the opportunity for either vaulted ceilings or loft living space. The combination of the various slopes and use of natural light make this design an excellent choice for homes with Eco-friendly conveniences, such as solar panels, geothermal and radiant heating systems. Cons: The complex design and various building materials needed will make the sawtooth roof much more expensive than other roof types. It’s also a high maintenance roof. Adding windows, valleys and varying slopes creates a higher chance for water leaks. For this reason, sawtooth roofs aren’t advisable in heavy snowfall areas. Suggested Materials: Depending on the style of the house, the roof can be made from wood, steel or reinforced concrete. A curved roof is much like the Skillion, or Shed roof, but the planes are curved. It is very modern and provides a unique, creative roof design. The amount of curve can vary from slightly curved up to an arch shape. Pros: Curved roofs are aesthetically pleasing and a way to have a home unlike any other. They also provide subtle shapes inside the home as well. A curved roof can be used to cover the entire home or a single section, such as an arched entrance. Since curved roofs are designed by the architect or builder, it can be customized to be advantageous to the region the home is being built. For example, in high wind areas, a roof with a lower slope would be more durable than one with a higher slope. While in areas that receive more snow and rain can have more of an arch to allow water to run-off. Cons: The cost of a curved roof will depend on the complexity of the design. Suggested Materials: The best material for curved roofs is metal. It will bend and shape into any form, plus the maintenance will be greatly reduced. A pyramid roof is a type of hip roof. All four sides come to a point at the top of the roof. There are no vertical sides or gables. Pyramid roofs are mostly used for smaller buildings, such as bungalows and cabins. They are also used for auxiliary structures, such as pool houses, garages and storage buildings. Pros: A pyramid roof is extremely resistant to strong winds. This makes it an excellent architectural choice for hurricane-prone and high-wind areas. The slope provides extra space for ventilation, attics or high ceilings. Plus, energy costs will be reduced by the overhanging eaves. Cons: The cost of pyramid roofs is higher due to the complexity of the design. A dome roof is polygonal with an inverted bowl shape. Dome roofs are great for adding unique and aesthetically pleasing features to any home. They are excellent choices for cupolas, gazebos or crow’s nests. Pros: Dome roofs are both beautiful in design as well as durable. Cons: The complexity of a dome roof makes them expensive to construct. However, depending on the structure, a prefabricated one may be available. Suggested Materials: Dome roofs can be constructed using shingles, metal and even glass. However, for a dome roof that will require less maintenance, metal is suggested. A combination roof incorporates a design using various roofs on the same structure for aesthetic and practical reasons. For example, a house may have a hip roof with a gable roof over dormers and a skillion over the porch. Pros: Using a variety of roofs adds architectural interest to a house. It’s also a great way to use the best type of roof for each section of the home. Cons: The more complex the design, the more expensive it will be. Adding different pitches and roof types will require more building materials and labor costs. Joining different roofs always adds valleys and ridges. These are the weakest areas of the roof where water can pool and leak. When choosing a roof, first determine what type will and won’t work for your area. For example, if you live in a snowy area, a higher pitched roof that is designed to easily shed off high accumulations of snow, can be one the most practical options. Once you’ve narrowed down your choices, then consider your needs. Do you need extra space or would you rather build an Eco-friendly house? Lastly, decide on the style. Take these important factors into consideration and you’ll have the roof and house of your dreams. I have an east-sloping lot on a small lake east of Atlanta, GA. I’m wanting to build a 44′ wide x 52’deep single story with a daylight walk out basement. I’m thinking that a 4/12 pitch East/West peak gable roof will allow water to run off the sides and down to the lake, also allowing for easy cleaning of leaves, pine needles, and pine cones off the roof. Am I correct in my thinking? Most homes have the roofline parallel to the road or lake and not perpendicular. I think the way you are thinking about it makes a lot of sense. I’ve seen plenty of gable and hip-and gable style roofs with the ridge-line facing the lake, as well as more conventional build-outs where the long side of the house and the roofline are parallel to the lake/road. Again, from an engineering and practical perspective your thinking makes sense. Ultimately, the architect and the builder should be able to offer their views on feasibility, practicality, re-salability of this new residential build-out. Re-salability and desirability may or may not be a major point of consideration here, since you may or may not have any desire of selling this property in the future. Hope this is helpful and am curious to see what you decide to do. I didn’t see my roof style in the article’s descriptions. I have a mid century modern home in Southern California with a 4/12 pitch and no attic space. Original design had a tar and white gravel roof with soffit vents in the eaves; we now asphalt shingles. Looking to re-roof. Really need better insulation. Suggestions for roofing material? My brother has an A-frame house with no attic space. He recently installed six inches of insulation from within the house, throughout the entire house’s walls including the roof deck/ceiling portion! Unlike California, where the climate is a dream, a poorly insulated house in the northeast is a nightmare, especially during winter! Anyways, now that the house has been fully insulated from within, he plans to replace the old asphalt roof with a standing seam metal roof and solar panels combo. That said, you can always add some insulation over the roof deck from half an inch to two inches in thickness. The old roof will probably need to be removed, first. The roofing system itself, though, doesn’t really act as a layer of insulation. As far as the roofing system choice, you could install anything from standing seam to PVC membrane! The roof fasteners will need to be long enough to penetrate the two inches of insulation and grip into the roof deck. By the way, for Southern California, both standing seam and PVC membrane are a smart, energy efficient choice for AC savings during summer! Lastly, since Southern California is so warm, we are primarily concerned with the AC load. Thus, even half an inch of insulation coupled with energy-efficient PVC membrane will do the trick. Two inches of insulation would probably be an overkill, as half an inch will do for PVC, considering a solar-reflective roof is really what’s needed here. The butterfly designed roof look so chic and modern. I love that it allows for bigger windows! I am vitamin D deficient and need lots of sunlight in Washington state! My name Is Greg Kapitan and I just wanted to take a moment to thank you folks for such a great roofing types blog post. By far the best blog on this subject complete with many photos! I will be following your posts as well… Thanks to all involved. Any idea on how to do it? I am finding it difficult to find a way of doing it. Should it have an inclination for the rain waters? It sounds like you would like to build a house with a flat roof and parapet walls. The roof will not be entirely flat, as you will need to plan for rain water drainage via water drains placed strategically within the roof surface. A PVC roofing system such as the one from IB roof, available in either 50-mil, 60-mil, or 80-mil thickness would be an ideal type of a roofing membrane for such a roof. The system includes all the components and flashing details. They also sell specially-designed rainwater drains. We are having a 10×24 ft. shed built. It was supposed to be 10 ft. high so a loft could also be built inside. Our HOA tells us it can’t be more than 9 ft. in height, even after our city has given us the permit. What style or roof would you suggest? We live in the Dallas, TX metroplex where we get strong winds, hail, and tornado warnings. The best roof shape for a high-wind area would be a hip roof, but it’s more expensive to construct than a traditional gable roof — a common roof for sheds. In terms of roof covering, standing seam metal roof would be the best option in terms of strength and durability, but you could also go with architectural shingles light-color roof designed to reflect solar radiant heat and stand-up to hail. Both standing seam metal roofs and architectural shingles designed for high wind areas would work, provided they are installed properly. Nice descriptions, but for those of us who hardly know house construction language, a few pics or drawings here and there would be perfect. We are building a house and trying to decide on a plan. We like this one house with multi roof lines, but want to stay within a budget. Is this type of roof more expensive? 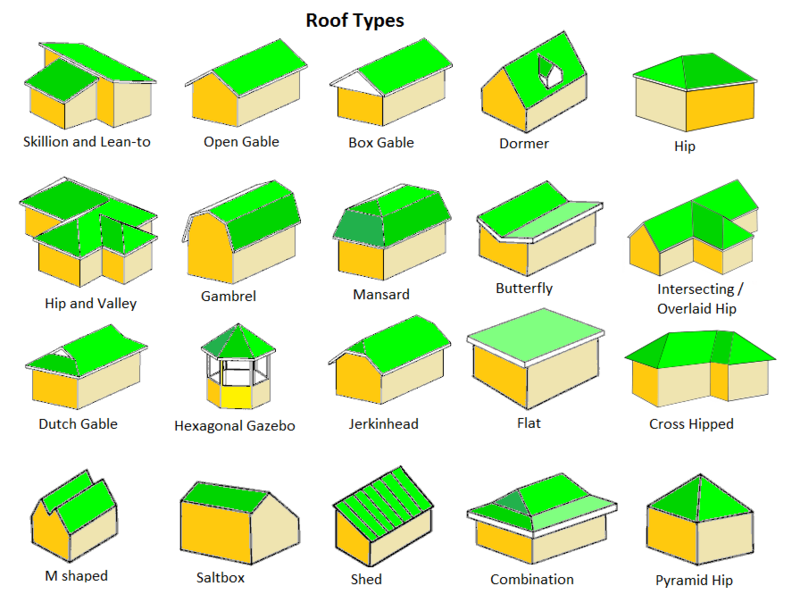 Thanks for this exhaustive documentation on roofs. My husband and I have been wanting to build a new home for the past few years so we are working on the whole design process right now. We aren’t really sure what type of roof would work best for us so we are weighing out all of our options. I had no idea that there were so many different types of roofing, we will have to consult with different contractors and see what opinions they have regarding what would work best for us. Thank you for sharing! Thank you for the description of all the many different types of roofs. I have a flat roof on my home. I agree that they do increase the outdoor living space. Hopefully, it will be one I can consider for my next home. I have an 1800 sq. foot house with a Hip roof. My insurance co. says that a hip roof costs $24,000 more to replace than a gable roof. I have a trussed hip roof on my house. It uses smaller lumber and a lot less material when you consider there is no brick wall needed up to the ridge. I can’t see so much difference. I would appreciate your comments on this. This actually makes no sense, as the difference in terms of labor and materials between a hip and gable roof is not all that significant unless it’s some sort of an expensive slate roof you have on your house. I can see a difference of $2,500 at most for an asphalt shingles roof, not $25,000. You can have a brand new metal roof installed for that much money, with quite a bit of money left over if we are just talking about asphalt shingles.